I started by making a bunch of cupcakes using a Fiskars cupcake punch. I punched one or two from every Pick-Me-Up patterned paper, more from Paper 10 which has all of the squares of different patterns. Then I chose a blue textured cardstock for the background and machine stitched lines every 1.5″ across it to create a grid. I got a li’l crazy with more machine stitching and used a variety of colors of thread – I only switched the main thread color, I kept the bobbin white the whole time to save on time. I did a poll on Instagram to see if I should leave the thread ends long like I sometimes like to do, or trim them up for a cleaner look. It was about 75% trim, 25% leave. I was going to leave them, but after continuing to work on the layout the threads just got in the way so I did end up trimming them and am happy with the results. Next, I placed a cupcake inside each square using dimensional adhesive. I printed five 1.5″ square photos and placed them over five of the cupcakes. Then I created the title “happy birthday” using the white Mini Foam Thickers. I added a “7” Chipboard Thickers number and typed “th” on my WeR Memory Keepers Typecast Typewriter to complete the title. I splashed white acrylic paint under each photo. The last step was to remove one of the cupcakes and write journaling in that open square with a precision pen. “Nothing better than getting a bunch of fun stuff in one place! The kit includes set of 15 photopolymer stamps, clear stamp block, 20 printed card bases and coordinating printed envelopes, giftable kraft box, die-cut accents, Stampin’ Spot, Baker’s Twine, washi tape, Stampin’ Dimensionals. 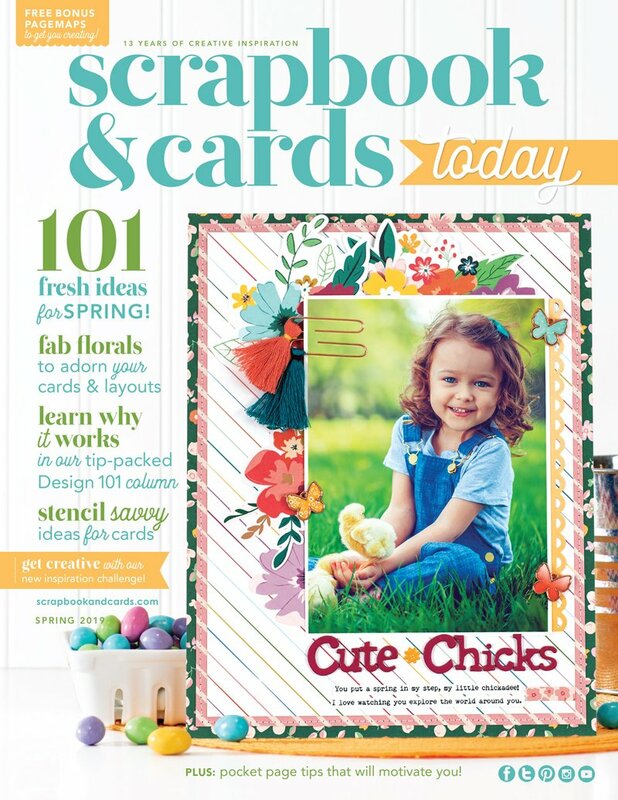 Happy birthday, Scrapbook & Cards Today!” ~ Stampin’ Up! Thank you to Paige and today’s sponsors for making Day 4 of our 12th birthday celebration so good! Be sure to join us each of these 12 days for fun birthday inspiration and so many prizes! You also don’t want to miss our fun Heidi Swapp Letter Board Giveaway here! OMG! What a super fun layout!! Thank you for sharing! Another day another awesome give away! How lucky we are to have the chance of winning these great giveaways for SCT’s birthday celebration. I’d be thrilled to win any of these!!! What a stunning layout. Perfect for celebrating this wonderful birthday!! Thank you for the inspiration. Thank yo to the amazing sponsors! Wow, beautiful ideas for layouts! Paige Evans is always so inspirational! Would love to learn brush lettering – how fun! What a great way to show the birthdays for an album. Great ideas. That is just fabulous! So much fun during this birthday celebration! More great giveaways today – Thanks! Okay…LOVE this layout! Those cupcakes are so fun, as is all that stitching. LOVE this!! Love the cupcakes! Thanks for the chance to win some super prizes too! 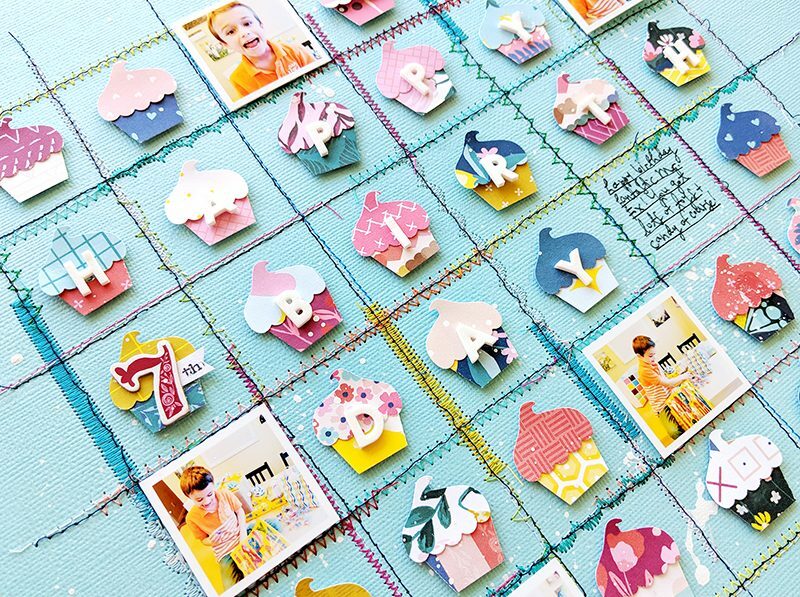 What a fun layout and awesome cupcake punch! Lovely giveaways!! Cards are beautiful! Appreciate the creative inspiration! Amazing page and layout! So many details. Love the colors. Fabulous and generous giveaways. Thanks for a chance to win. Love SCT! Happy 12th birthday! I’m going to made a card with this layout! It will have a whole lot less squares but it will work great! What a beautiful layout! I love all the tiny cupcakes. I can’t stop looking at all the stitching details on that layout! Happy birthday SCT and thanks to all the prize sponsors. Wow! That’s incredible! I’m amazed at how much you fit on that page, and it looks great! I just purchased the We Are Memory Keepers sewing machine, this gives me a great idea for how to try it out. I love the stitched boxes with the mini embellishments. Thanks. Wow Paige! This layout is amazing! I love all the little cupcakes and such a great way to use up scraps! All those stitches just add some great texture to the page! TFS! Another wonderful prize pack for today! Thanks for the chance to win. Beautifully crafted layout, so cool! What a clever layout. It would also work for other seasons and holidays. I’m thinking of Easter and all those bunnies and chicks. Thanks to Stampin’ Up and American Crafts for their generous gifts. What a FUN page! I love the 3D cupcakes. My dgd turned 12 this month. I need to get a photo of her to put on a page like this. I also love the watercolour effect on those cards. Got my mind going with how I could use this! This is a wonderful layout! 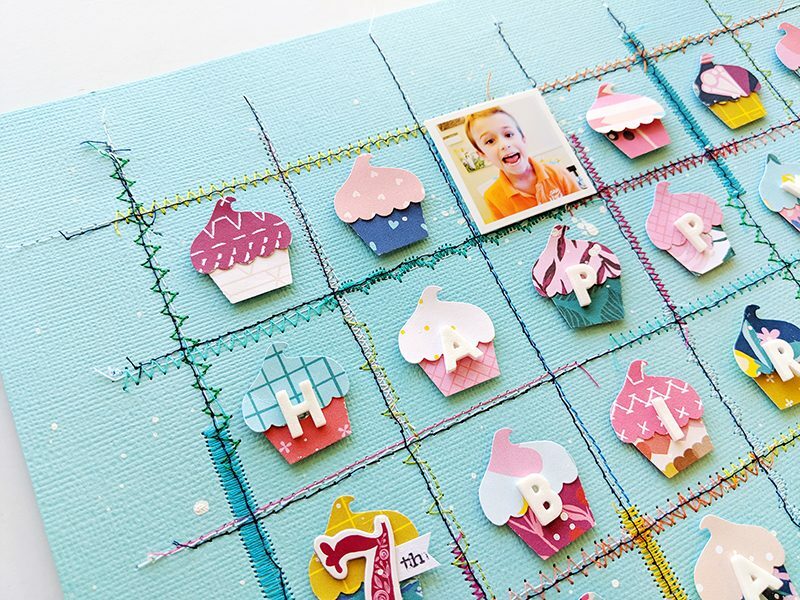 I love the way you made a grid on the paper and then filled the squares with cupcakes and photos, super cute idea. Thanks to Stampin Up and SCT magazines for the chance to win these great prizes. What a detailed and lovely layout. I love today’s prizes, they’re amazing! Happy Birthday! Love the layout, I still haven’t attempted stitching on a layout but will have to soon. Thanks for a chance to win some great prizes. What beautiful ideas and cards. Thanks for the great ideas and Happy Birthday to a great magazine. More great prizes! Thanks for a chance to win! Very clever grid layout. I like the stitching and cupcakes. The layout is soooo fun and cute! Love the cupcakes! And also a wonderful giveaway! Fun page with all those cupcakes! Love Stampin’ Up and American Crafts! Wonderful giveaway to celebrate SCT’s 12th! Wow! This just blows me away! I only wish I knew how to sew! Very, very cute and clever! I wish to add my “Happy Birthday” to the shout-outs for SCT! Keep up the good work! THANKS for the prizes too! Happy Birthday SCT and also to Mr FX so deserving of a page like that! Thank you for giving us your birthday party! You are all so generous. I would love to try the Stampin’ Up card kit. I love the flower decals. Learning to do caligraphy has been a life long wish – unrequited. Thank you again for the birthday presents! WOWZA, super cute birthday layout. Love the stitching. And what a give-away, my goodness, amazing prizes. Thanks SCT and the generous sponsors. Love the cupcakes. So cute. What a wonderfuTul colors. Thanks to Stampin Up and American Crafts for the great giveaway. Lovely layout Paige! I can’t wait to try stitching!. What a fun layout! And more great sponsors and prizes! Fun layout idea! Love the prizes today. Both have been on my list for a while. The layout is amazing, love the stitching. Wonderful prize packages, thanks! Love using punches? thanks for a wonderful layout! Oh Paige, I have to say you did once again a great job. This time, you played around with multiple colored threads and sewing stitches which I absolutely adore! Thanks for the inspiration! I love that scrapbook page. I have always wanted to try sewing on my cards and pages, but am a little intimidated by it. I never thing of using my sewing machine…great layout. Oooh!! What a gift! The lettering I’ve been trying to learn would be awesome. I love the cards! Thanks sct and sponsers for a great celebration!! Thanks for sharing such a cute layout and for another day of amazing prizes! Love that it’s your birthday but we are all getting the gifts. I love stamin up!!! Especially their kits!!!! Thanks for a chance to win! I love the cupcake ideas. Cool prizes today. Oh wow I would love to win this prize! Thanks for the opportunity! Such a fun layout. Love the cupcakes and the stitches! Thanks for the giveaways! I love love love this layout! And the prizes too! Happy birthday and thanks for the chance to win! Love all the cupcakes Paige! Would really like to win Kelly’s brush lettering prize – my lettering style really needs some brushing up ?. Love the idea of repetitive punches being used as a layout. What great inspiration! Another wonderful prize pack too! Fun layout and great way to use up scraps. Great for any age or gender. Love the layout!!! Always a sucker for stitching in a layout. Such a great prize package! Thank you for a chance to win! I’m not a seamstress but I think I will try this design with fax stitches. Thank you to Stampin Up and American Crafts for the great prizes. Thanks, Paige, for the unique, fun idea. Thanks SCT for arranging these amazing giveaways. Wow what a nice idea for a layout. Wonderful-creative celebration so far 🙂 I would love to win this and would share with my niece (since they are not teaching cursive in school anymore) – she will love it! That layout is Fabulous and so fun!! I can’t wait to try that. Wow, what a novel and different layout idea!. Love the cupcakes. Thanks for a truly unique and inspiring layout Paige. Again more great giveaways thanks so much to the sponsors. Off to find my cupcake punch! This layout is perfect down to the smallest detail – to say it in german : ein wahres Meisterwerk, Paige! So cute; love that cupcake punch! Great layout! Thanks for the inspiration! Thanks for the chance to win an awesome giveaway too. 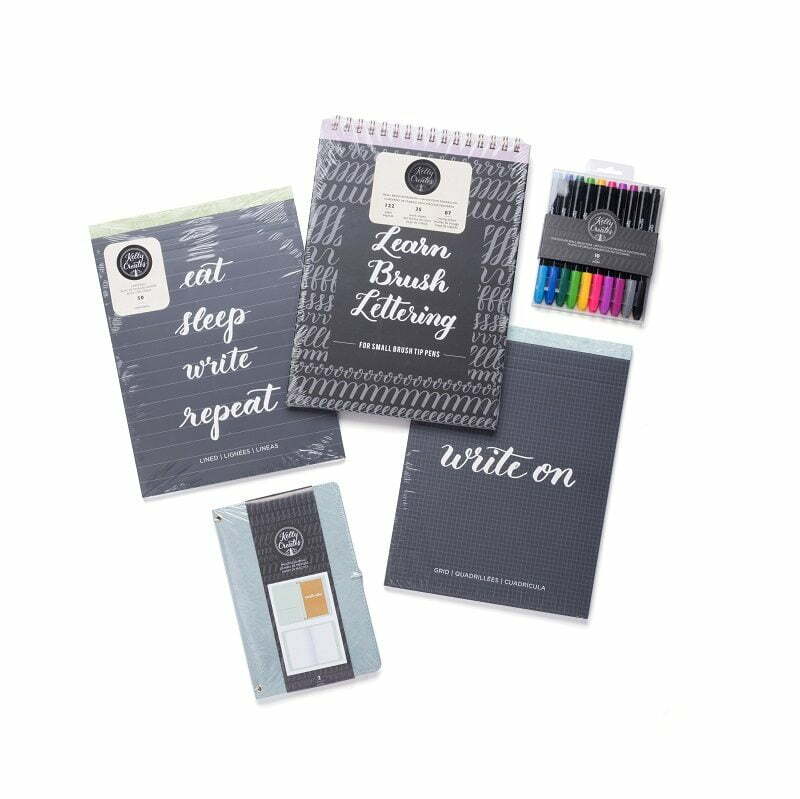 Love the giveaway package and would love to learn brush lettering. Thanks! What a cute layout. I LOVE all the stitching! Thank you to American Crafts and Stampin Up for the wonderful prizes. I love brush lettering…I just need to learn how to do it!!! Love all of the fun stitching on Paige’s layout. So fun! Thanks for the chance to win such awesome prizes! Been wanting to learn lettering. Wow what a great layout Paige. And another great prize pack. Thanks to Stampin’ Up, American Crafts and SCT. Now that’s my kind of sewing. Thanks for he great giveaways! What a great way to use up scrap and make something fun! I love your layout with all the tiny cupcakes Paige, I miss the trim or not trim post on IG but my vote would have been trim–can’t help it my CAS loving heart would have to trim. Great prizes again today! Fantastically fun and festive layout! More great prizes today! Thanks SCT, Stampin’ Up and American Crafts. What a fun layout! All those cupcakes are darling!! Thanks so much for the chance to win! OMG, the prize was made for me! I have the worst handwriting and am super envious of all the fancy brush lettering I see but have no idea how to do it in my own work. I have chalkboards where I attempt to replicate the look also with not so great results. I didn’t even know these existed but will be sure to ask my lss about them. I love the layout as well. I love sewing on my layouts and can see myself copying this idea, so thanks for the inspiration. Great layout such a happy feel to it and so cute. Thanks for sharing and the chance to win some great prizes. Love seeing all the excitement each day! Thanks for sharing another great project! Way Cool prize PACs for day 4 – thanks to SU & CA for their generosity. bow – Who’s making the birthday cake SCT? ? Paige: what a great LO – very celebratory! Thx? Love Paige’s layouts. Love the prizes, thanks for the chance to win. Omg, it gets better everyday! Awesome prizes, ? Love the give aways thanks to our sponsors. Who wouldn’t love either of them . Thanks SCT . That is an amazing layout! Love it! Thank you Stampin’ Up! and American Crafts! Love all the stitching you do on your pages! Thanks Paige for a fun layout! I love this giveaway – Stampin’ Up! Is awesome and I’m try8ng to learn brush lettering! Thanks for the opportunity! That is a perfect birthday page. Just fits the theme perfectly. I’d love to win this prize! I’m wanting to learn brush lettering and have been looking for tools like this!! Happy Birthday SCT and thanks for letting us in on the celebration. Beautiful birthday layout and wonderful prize giveaway today. Oh my goodness-this layout is sooooo adorable! So many cupcakes and all of the stitching-Wow!!! Love the layout… and the giveaways!!! Thank you so much Stampin’ Up! And American Crafts! Great prize packages! Happy birthday and thanks for the chance to win!!! Cute layout! Happy b’day & thank you for the great giveaway. So much work on that layout! But so cute. Thanks for today’s giveaways love American Crafts and Stampin Up. What a wonderfully happy page, thanks for the inspiration. Thanks also for all the giveaway opportunities, there will be some very happy crafters at the end of this! Love the frogs layout and using the punches! Very cute! Thank you to Stampin’ Up and American Crafts for the fun giveaway today! Adorable layout! Many thanks to SCT, Stampin’ Up! and American Crafts for the chance to win these amazing giveaways! What a great layout! Such a fun birthday week! Thank you and your sponsors! What a really neat layout. I love all the different stitches and colors of them too.I don’t scrapbook but I think you could make this into a card. Happy 12th Birthday SCT and thank you Stamp’ Up and American Crafts for sponsoring a wonderful prize! That is such a fun layout! Love the texture and colors from all the different stitching! Thanks for a great giveaway! Great ideas for birthdays! Happy 12th Birthday SCT! I love the card samples. Thanks for the chance to win the Kelly Creates gift pack. Amazing layout! Love the cupcakes! More great giveaways. Happy Birthday SCT. The cupcakes are so cute – what a fun layout!! Love the cards and the giveaway – thanks so much!! Love the cupcakes, Great fun layout!! Love this layout! I need to get my sewing machine repaired. You’ve inspired me. That is a neat idea for a scrapbook page, thanks for sharing. Thanks to Stampin Up and American Crafts for their giveaways. Thank you for today’s prizes!! Birthday celebrations are always so much fun here! Happy Birthday SCT!! What a super cool layout! Thanks for today’s prizes! Such a fun layout. Great prizes, thank you! What a fun layout! Gotta love lots of cupcakes!! Great prizes too! Happy Birthday! Thanks for the chances to win! This layout is very inspirational! Maybe it’s time to dust off my sewing machine ? I just started stitiching on my layouts and I am obsessed. I love Paiges layout. Her projects are always so inspirational. Thanks for the chance to win another great giveaway. I would love to learn brush lettering and the kit, wow so many things you could do with that. I love the layout, and what fun giveaways! Paige always looks like she enjoys creating her layouts…and we love looking at them! What a clever layout! It’s so adorable! This birthday giveaway is mind blowing!!!!! Paige is amazing and the cards from Stampin’Up are just as amazing! Those pens too!!! Wow!!!! Love the cupcake project. The stitching sets it off. Great idea. The sponsors are my favourite companies. Thanks SBCT and the sponsors. I absolutely LOVE the itty bittys on this layout!!! Thanks for the great opportunity to win these things from your great industry partners! Happy Birthday S&CT!!! I am definitely having a great time celebrating with you all! Thanks for the inspiration!!!! Absolutely LOVE the cupcake layout! Will definitley try this with tulips! Happy Birthday! Great prizes yet again from your sponsors! love the layout and WOW love the giveaway for today!!! Fingers crossed!!! Who doesn’t love cupcakes? Such a fun birthday page and such a great birthday giveaway. Thanks sct. All those little cupcakes are soo cute ad another day of wonderful prizes – You Guys rock! Love, love, love that layout! Thank you for another chance to win fab goodies! Cute layout idea. I love the stitched grid. An amazing LO Aand fantastic prizes. Happy birthday SCT ?? Love the layout and the prizes for today. This would be a fun kit to win. Love to make cards for all my grandkids. Very cute. That layout is the sweetest thing ever! WOW! Thanks again for another wonderful chance to win fabulous prizes! I just LOVE the beautiful birthday layout! Another day of great prizes from great sponsors. Thank you SCT. Such a cute and creative layout, thanks for the inspiration. When I first saw the layout I thought it was a bingo game. Lol what a funtastic layout!!! Great layout, totally scraplifting that one and my most favourite prize day yet! Wow! That layout is stunning! I don’t have the patience to cut all those pieces. What a fun scrapbook layout! Paige, you do such amazing work. I received a sewing machine for Christmas and this definitely inspires me to try something creative. Another day of amazing prizes. Thank you! What a layout – wow! Thanks for the inspiration and the amazing prize opportunity! What a fun page, love the sewing and the cupcakes. The items in the giveaway are great. Happy 12th birthday SCT. Cute ideas! Thanks for the chance to win. Love all the colorful cupcakes! So fun! Happy birthday, SCT! I’m a new subscriber, and I wish I had known about you earlier! Another great layout by Paige! Fabulous prizes from great sponsors. Thank you American Crafts, Stampin Up! Happy birthday SCT! All the best for continued success! Love this layout! Everything Paige creates is just a stunning feast for the eyes! Thank you for the inspo Paige and SCT thank you for everything you do! Happy Birthday!!! What a gorgeous layout and what great prizes. Good Luck everyone! 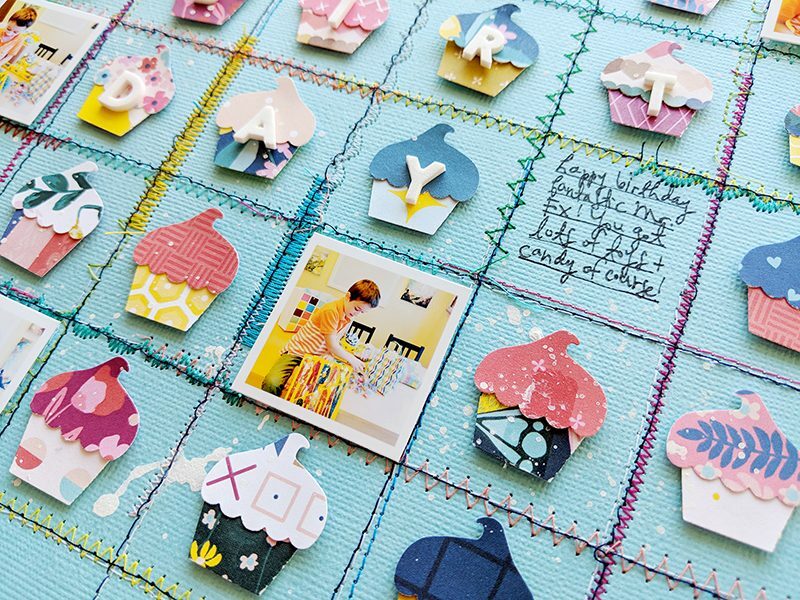 I love the layout – all the beautiful colours of cupcakes, the fun stitching in different colours, the cute little photos! Fabulous! Love todays projects!!! Thank you so much for the chance to win such great prizes. What a creative layout. Love the inspiration! Cupcakes and birthdays. The perfect combo. Great layout. Fun layout and a great way to use the cupcakes! I love SU! Excellent prize today. Thanks SCT!! Amazing layout! Going to try this with my granddaughter’s first birthday pictures. I love Paige Evans ideas and have used them in many of my scrapbook pages! As usual many great prizes. Can’t wait to see what’s next. Very cute scrapbook page! Thank you Stampin’ Up! and American Crafts for the chance to win a card kit. ABSOLUTELY FABULOUS layout – LOVE the stitching and design – WOW! Another day of awesome giveaways! Love Stampin’ Up! This layout is simply amazing. I love it and I am so inspired by it. I have been planning a layout of photos from last summer and this is exactly the idea I needed. I can’t wait to get started! P.S. Thank you for the great prizes– Happy birthday again! Thank you for celebrating by giving presents to *us*! wow! Wow your birthday and we get the gifts…you guys are great and so is this prize today. Thank you for this chance to win. I am totally inspired! I love the repeated pattern of the squares and cupcakes that gives your page order – then you go nuts with the stitching to add some fun. Just love your style! Love the cupcakes – each so different and cute. Such a fun layout! I’m going to go dig in my stash to come up with something similar. Thank you. That page is a celebration! Love the inspiration and thanks for a chance to win today’s awesome prizes. Cute cute cute cupcakes, what a great idea for using them. I also like the idea of asking on IG for feedback, I always hesitate to ask wondering if anyone will respond. lol Happy Birthday to SCT! Thanks for this wonderful party. I really love Stampin’ up, I use it almost every week. Love the layout it is sooo cute!! Awww!!! What a cool and fun layout! Love it!!! Such a beautiful and creative layout! I love it! Thanks for the chance at today’s prize! Stampin’ UP! and Kelly Klapstein’s American Crafts products. Such a wonderful pairing. This party is getting better and better every day. What a fun, creative layout! Thanks for the chance to win such fabulous prizes! Great idea. Congrats on the 12 years. Wonderful giveaway. Thanks for the chance to win. Not sure what I can say about your LO Paige…. except I love everything about it! The blue textured cardstock really adds dimension and a great look to the LO. The little pieces of goodies are awesome. Great job!!! Paige’s cupcake layout is breathtaking and delightfully festive! Great prizes too! ???TFS! Cute layout! Lots of details! And another great giveaway! How fun! What great giveaways! Thank you for the fun project ideas, as well as the chance to win!? I’m loving the cute cupcake layout! Great way to use up some leftover paper & I almost always need to put in more pictures! The prizes are great too….especially eyeing that brush lettering prize after taking the class with Nicki at Crop and Create! WOW… that is one amazing and super fun layout! This would be fantastic to try!! Thanks for the opportunity! How creative. I like all of the little details. How cute! I love that you used different types of stitching, as well as the letters, cupcakes…. I would love to learn lettering, would be amazing to be able to that free hand! Stampin Up is always awesome! Great layout as well, great idea for using the same punch. Love the layout!! Is inspiring me to use my sewing machine! Wow this layout is so fun and love the grid pattern. Time to get punch-y again! This layout is SO adorable and I love the stitching! thanks again for all the inspiration and prizes during your anniversary. Happy 12th! What a great idea. Thanks for the inspiration and the chance to win. I am hoping to win something. That layout is a lot of work, and that paid off big. LOVE IT! What great cards and things too. Wow – that layout is adorable!! How fun! Love all those little cupcakes. What great sponsors for your 12th birthday celebrations so glad I can celebrate with you all #SCT ?? What a fun layout and a great way to use up scraps!! Awesome giveaway, I would love to learn brush lettering! A stylish and unique layout indeed! How cute. The cupcakes are adorable! What a creative layout. Beautiful cards. Would love to win these prize packs as I love making my own cards and could use some help with lettering. I’m still a novice at lettering and would love to become better at it. Such a beautiful layout! Love what you have done here and thank you for this fabulous giveaway! Happy 12th birthday SCT! Wonderful project and cards! Thanks for the inspiration! Love the fabulous layout. So creative. Love, love, love that layout! I love the layout, what a great idea! Super Happy I already own that cupcake punch! Great Layout! I’ve always wanted to learn brush lettering, hope I win! This is a really unique design, love the sewing on the page. Am inspired again by this amazing layout! Thanks for all the creativity, SCT! Love the layout! Want a cupcake punch! Thanks for more great prizes to win! Oh Goodness! Love the colors and playfulness of this project. Love the prizes for today too! What an amazing layout! You have inspired me to get out my sewing machine again! Thanks for the inspiration.Thanks also for the chances to win such amazing prizes. Happy Birthday SCT and good luck to everyone! 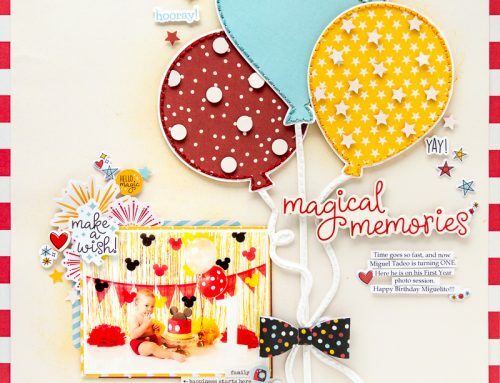 Happy birthday SCT……great layout and love love the card kit…..thanks for the chance to win! What a fun layout. Thanks for the inspiration. Another great prize package – good luck to everyone! Fun layout for the SCT birthday celebration! I love all of the different stitches on the layout. I may need to scrap lift the idea and mix the stitches. Thanks, SCT, for another day of great prizes. You rock! Oh my….what a cute layout! Thank you for the inspiration. Appears to be lots of work on this page layout but reproducing the cupcake to fill the squares is a great options. Love the materials used. Hapoy burthday! What a fun idea! Love the cupcakes! What a great birthday layout! I love the cupcakes….what a great way to use scraps. Fun techniques on this layout. I like using all of them. Awesome layout Paige! My granddaughter just turned 5 over the weekend. 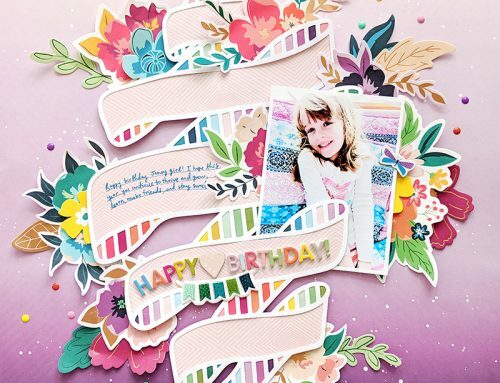 This sure provides the inspiration for a darling layout celebrating her special day. Thank you SCT for the wonderful prizes! Very cute layout!! Love the prizes too! Happy Birthday!! Will it improve my penmanship. Love the layout and chance to win great prize. Thanks. Oh my, drooling a little over the prizes today! Stampin’ Up! plus some great brush lettering resources. Yummy! I love the cupcakes. They look good enough to eat, Happy Birthday Celebrations. Very cute all the things!!!!!! And happy birthday ????? and I love to win all the great prizes (all) ????? Now this would be something new to play with. I’ve been dying to learn brush lettering. Thanks for the opportunity. These are wonderful prizes. Paige’s layouts are always gorgeous – thanks for the tips on how to recreate it. Love the prizes too. Thanks for the chance to win! Wow! This layout is do much funl. Thank You for an amazing giveaway- Andrzej chance to win! Love the cupcakes! Happy Birthday! I may need to dust off my sewing machine. Love all the stitching on the layout. Happy Birthday! My daughter would love this. She is just getting into brush lettering. I sew on my cards but not on my layouts. Thanks for the inspiration. What fun prizes from two great companies. Happy Birthday SCT! Cute layout. Love how the various stitches create the grid. So freakin cute!!! Love all those cupcakes and the fabulous stitched grid! Awesome birthday layout! What a cool idea!! Unique and fun. Love it. Cool layout and awesome prizes! I love making cards, that card kit would be wonderful to win!! Love the cupcakes now to go do something with this design. Trying to follow each day and spending time working with paper! What an amazing layout!! I love the stitching details and cupcakes, thanks for the inspiration and another great giveaway. Such a fun layout. The card kit looks amazing! Happy Birthday SCT! I love the cute cupcakes!! Super adorable! What a super fun and gorgeous layout! Happy Special Day 4 SCT! That LO is beyond amazing! That cupcake layout is so cute and creative! Very cute with all the different cupcakes! You Rock SCT!!!! Thank You Stampin’Up and American Crafts for your giveaways! Absolutely love the stitching and all the little cupcakes. Thanks for another day of giveaways! I love the layout and the giveaway. Happy birthday, SCT! Such a fun layout! I’m going to try this idea on a birthday card. Thanks for the inspiration! Love the prize pack too. Fingers crossed for a win? Happy birthday! Great layout and awesome prizes! Ah my what an adorable “quilt” love how fabulous it all came together. Many thanks! What a cute layout, and the cards are awesome! Cool layout that inspires me to drag out my own sewing machine! Thanks SCT for the chance to win these great prizes! 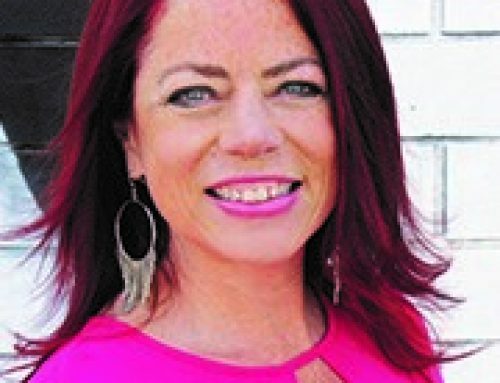 Paige Evans is wonderful and I can’t wait to try her idea! Great prizes also! Cute and fun layout! Happy Birthday SCT! What great prizes for day 4! Would be difficult to pick from the two! Happy birthday! What an AWESOME layout! I love the grid and having something in every square. Definitely going to have to try this! What great prizes for today! Thanks for the chance to win! The Birthday layout is so cute. Have to make one for my daughter who loves cupcakes. Happy Birthday! What detail on that layout. AMAZING! How fun is this – – sewing and paper crafting. Doesn’t get any better. Except to add the prize for today. Learning hand lettering; which is on my crafting bucket list!! Thank you and again, Happy Birthday!! What a fun layout! I am always afraid to sew on my layouts but this has inspired me to try. Those brush lettering pens look amazing. Happy Birthday to a great magazine. What an amazing layout!!!! 🙂 Thanks, SCT for the amazing give-a-ways!! Amazing – to sew that much on a layout! Looks fantastic. Also I have just started to learn brush lettering and I find it very difficult to learn. This would be a great give-a-way for me to receive. I could use some pointers on how to do it as I am left handed. I am going to have so much fun trying these ideas out. Thanks for sharing. I have to say that Paige did a GREAT Page!! 🙂 Super Creative! The Card Kit looks amazing!! Such wonderful prizes!!! I just did brush lettering on a giant bulletin board at school (using a sharpie as my tool), and I would love to get way more practice as I loved the end result!! Bring on this prize!! I adore Paige’s scrapbook layouts. What a super one for Fox! So many cheerful colours and how brilliant to use the cupcake punch! Love it. This layout is completely adorable. I am so inspired to make something similar! Love it! Amazing! Thanks for the chance! This layout is adorable! I’ll be scraplifting this one! I adore all the creative ideas. Paige’s layouts are great! 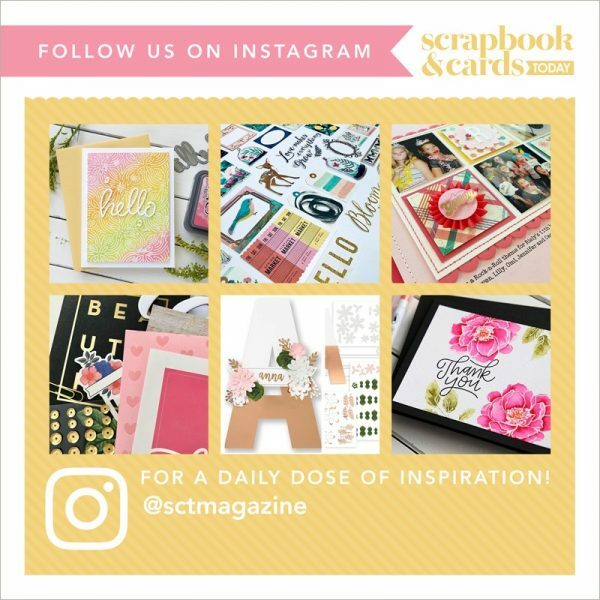 Such a cute layout by Paige and SCT is just full of inspiration! Another fabulous day of birthday celebrations! Thanks for the invite to the party!!! ???? Wow! All that stitching is amazing. Your layouts are always so fun, detailed, and unique Paige! 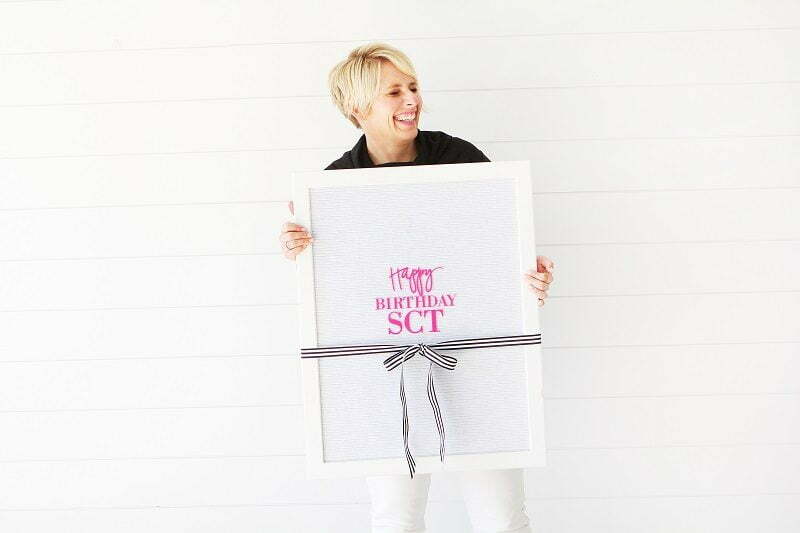 what great giveaways for your birthday SCT! I have always wanted to learn how to write beautifully, so this would be an awesome prize! Wow! All three things that I’d love to do! That layout is going to be scraplifted/Pinned thousands of times-lovelovelove it! I’d love a card kit cause I just can’t make em right and I’d get to handletter them which is pretty dope. Happy Birthday! Here’s to many more awesome years ahead. All the prizes look amazing! Another wonderful prize pack – thanks Stampin’ Up and American Crafts – love your companies! This layout is incredible!!!! I love it so much. 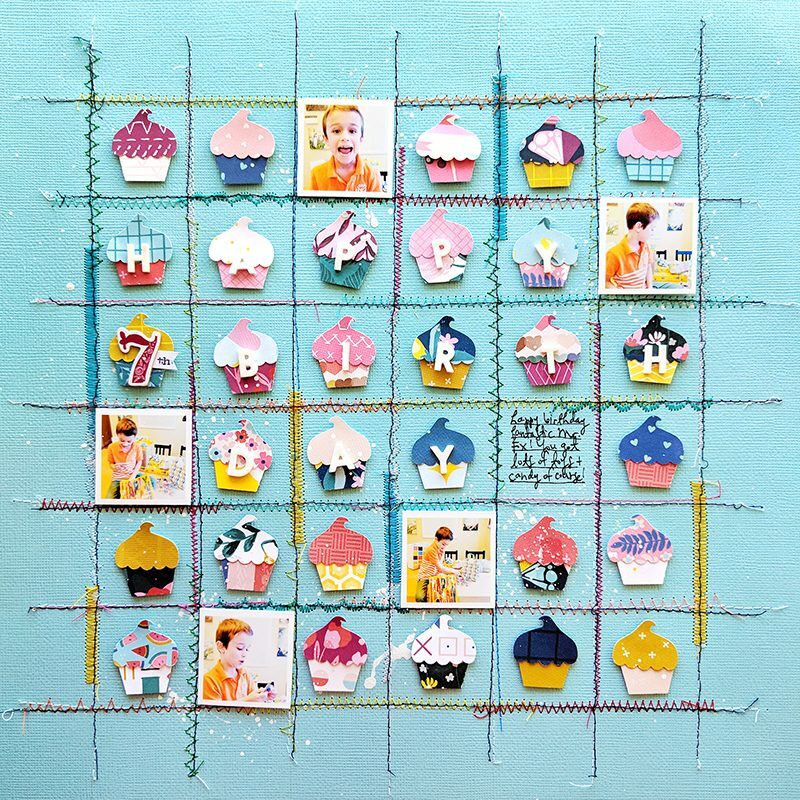 Adore the wonderful little cupcakes on that blue background, and the stitched grid. Love it, love it, LOVE it! Beautiful layout! And exciting prizes! OMG this is the one – the one I need! I want to get more into cards and my brush lettering leaves little to be desired. This is an amazing win!!! Oh my gosh. I love this layout. The colours are beautiful and the cup cakes are so sweet! So great, makes me want to play with punches! Happy birthday lovely SCT team! What a fantastic layout. Paige’s page always so fun & creative. Awesome layout a great way to spend a day off is to try this…. Love all the ideas we are getting this week! I love birthdays! Paige…you never cease to amaze me! That page is gorgeous!!!!! Happy birthday SCT and thank you to all the contributers! Who doesn’t love cupcakes. Nice layout. Love the giveaway. Thanks for a chance to win. Fun layout! Happy birthday, SCT! Your birthdays are always fun to celebrate! Thank you again for the chance to win such wonderful prizes! The ideas and the variety of prices are so cool! Happy birthday! Love this layout! How does the stitching not make the paper tear? This is a fantastic layout! I love the idea and the detail you see when you look over the entire page. Awesome! Another great giveaway! I am a fan of Stampin’ Up!! What an amazing layout! Love it! Happy Birthday! Happy Birthday – yay gifts for us!! Kelly and Stampin up Hooray! I Love everything about this layout – such a great idea to use a stitched grid. And the cupcakes! So cute. As much as I love making cards, the Stampin’ Up kit is very pretty and would come in handy when I need a last minute card. Would love to try fancy lettering. Thanks for a great giveaway. What a crazy idea. I love to see things that are different and such a great way to use up all kids of odds and ends. I especially like all the different stitches. FUN!! Just beautiful. Never too many cupcakes I say. Thanks to American Crafts and Stampin Up for sponsoring the prizes today. I love the stitching detail! What a cute idea!!!!! Thanks to the sponsors!!!!!! Paige’s layouts are always a work of art! The prizes are delightful, great way to celebrate! Oh to have half the talent of Paige! Adorable layout! Great way to use products you have or want! What a cute idea for a layout and thanks for the chance to win the Card Kit. Delicious layout!! Thanks for the chance to win some great prizes. Those prizes are awesome! Thanks for the chance! Love the layout! Thank you Stampin Up and American Crafts for the giveaways! Your talented friends have the greatest ideas! Make sure you invite them back! Let the celebration continue! What a fantastic layout! I love the grid and smaller pictures! Very creative and cute layout! Thanks for the opportunity to win some wonderful prizes! So much goodness. Love Stampin Up and American Crafts! Cute cupcake layout. Think I’ll make it into a cupcake calendar! Thanks for the inspiration. This inspires me to get out my sew machine and practice! Love the inspiration and the giveaways! Happy Birthday SCT! I love grid layouts and this one is absolutely gorgeous!! Happy Birthday SCT! This layout by Paige is inspiring! I’m going to try this stitching technique on a layout this weekend! Thanks to Stampin’ Up! and American Crafts for the great giveaway prizes! SU’s kits are great! All those cupcakes on the scrapbook page makes me hungry for cupcake. It must be that kind of a day! Happy 12th Birthday! Paige’s layout would make a perfect sign for a cupcake shop!! Yum! A lovely combo – cards and lettering supplies. Thank you AC and SU for wonderful prizes. That page must have taken forever to make with all those cupcakes and stitching! Stampin’ Up! Was my gateway into scrapbooking and card making I still use so many of their products. Would love for this prize pack to be mine! So inspiring and opportunity to use my scrap paper. Thanks! The cupcakes are adorable. Thanks for the chance to win! More great prizes! Are you sure it’s your birthday not mine? Really love the SU card kit. Such pretty colors! And the Kelly Creates prize pack is great. I would love to learn more about lettering. What a lovely SU card kit & I’ve always wanted to learn Brush lettering!! Thx for the chance!! OMG – the layout is gorgeous! Would love to win this! Happy Birthday! Love the sewing layout – another way to use a great tool! Who doesn’t need a card kit? And the lettering items could inspire. Happy 12 th Birthday!!!! I would love to win and a tidbit of FYI for all your readers. I live in Edmonton , the same city Kelly lives in. Fun! Fun! Fun! Love the grid and the stitching! What a unique idea for a layout page, I will keep this one in my mind to attempt. Wow, Paige! What a gorgeous layout! Love all the stitching! Thanks for the inspiration and for the chance to win those amazing prizes! What a gorgeous layout! Love the colorful cupcakes and the threading is the perfect whimsical touch. I think this would look great on a card!! Happy birthday SCT. Love you guys. how many ways to decorate a cupcake? and that card kit is so pretty. Paige, Paige, Paige…. you are at the top of your game girl. Oh my. Really like Paige’s layout. Happy 12th Birthday and thanks for opportunity to win Stampin Up and American Crafts prizes. What a fun layout!! Now I want a cupcake punch, lol! Another day of super giveaways from super companies!! Thank you SCT for the chance to win! Happy 12th Birthday and many, many more!! Such amazing creativity! Thanks for sharing and for the chance to win some great prizes! Happy birthday to SCT!! Thanks for 12 years of happiness! Wow! !”I’ve the line up !! So cute! I love how your giveaways are just as creative as the ideas your magazine details! These are amazing! Thanks to the sponsors and another great day giveaway to celebrate your birthday. 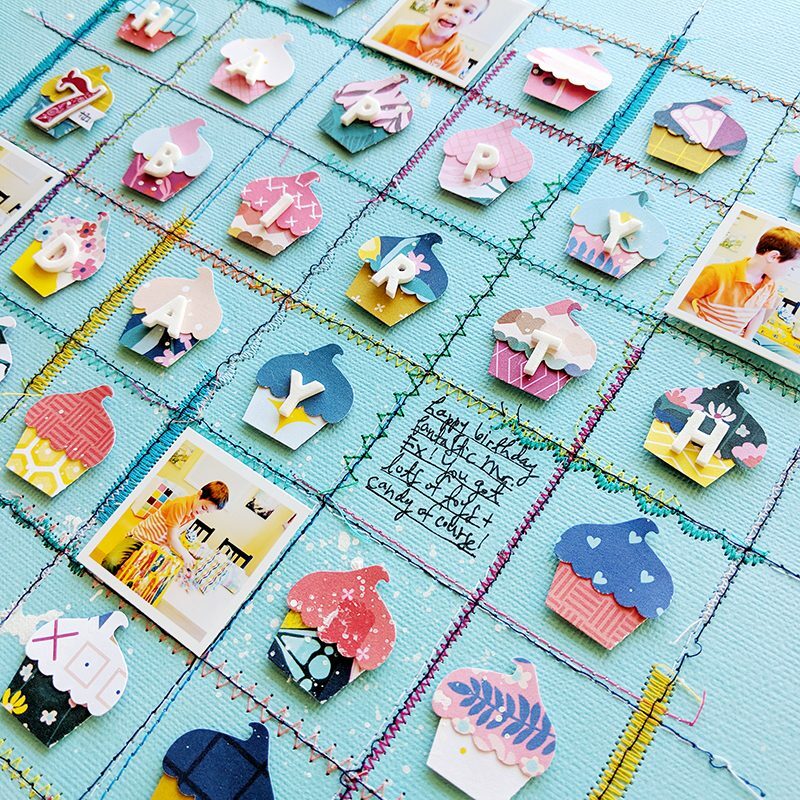 What a fun layout, so many different ways to recreate this…! Love this idea especially all the different stitches! Such a creative layout! Love all the bright colors. Thanks for the giveaway! Stampin’ Up! and American Crafts are two of my favourite companies in this industry – thanks so much for sponsoring today’s excellent prize package! This layout is great, has a real birthday feel. I love the sewn grid pattern. Great idea, thanks. Oh wow, what a fab fun layout! What a fun layout! Thanks for sharing Paige. I think this layout would be a great way to show different birthday parties through the ages, various themes used etc. Great idea Paige! I have been looking for the lettering set every time i am in Michaels, no luck so far. What a super duper fun layout! Love! Awesome prizes too! Happy birthday! This is so clever and lovely? thank You for sharing nice idea for a perfect layout! Awesome stitching on that layout! Happy birthday to SCT Magazine! Unique layout! Great prize packages! Would love to learn the how-to’s for brush lettering! That layout was super impressive and such a lot of intricate work…”AMAZING”. It has inspired me to use my sewing machine a bit more in the pages I do. I will have to dust it off and get it ready to go LOL. Thanks for the ideas. Wow, the donors are so generous. That is pretty amazing too…good luck to all those who have entered! Super cute layout!! Love these sponsors too!! Thanks for a chance to win. Wow, this is a really impressive layout built up from such simple elements. I can see trying it with flower punches substituting for cupcakes. Thanks for the idea. This would be a great birthday page in my granddaughters scrapbook. I would love to learn brush lettering! Amazing prizes! Thanks again. Paige’s layouts are always so bright, fun and full of texture! They truly are pieces of art. A big thanks to AC and Stampin Up for contributing today’s prizes. THOSE CARDS!!!! I have really been trying my hand at new writing styles. Would love to try this set out. Happy 12th birthday SCT!! Another great prize, but I wouldn’t expect any less from you. You never disappoint! Love this layout. The bright colours and the creative use of stitching are wonderful! Would love some more practice for lettering after taking Nikki’s class at crop & create! I love all the tiny details of this layout.!!! What a super fun layout! I’m inspired to dust off my sewing machine. Love the prizes from Stampin Up and American Crafts! Celebrating with SCT is fun!! Happy birthday! Love all the cupcakes! Paige is the best! Love all of her layouts! What a beautiful layout! I love all the tiny cupcakes! Love all the layouts SCT!! Cute layout. I never would have thought of this. I love the tiny cupcakes. I would love to learn brush lettering. It looks so beautiful on a layout. What a cute idea! Love the little details! The layout is really unique! ?? Forgot to mention in previous comment….LOVE Heidi S! Her pic in this blog post is so perfect…her personality truly radiates and uplifts!! Love SCT! Happy 12th birthday! Always so many great ideas!! Love this so much . So excited to see Stampin’ Up in the giveaways! Awesome projects featured! Stampin Up products rock! Happy Birthday SCT Stampin up and American Crafts & Heidi, thanks for the giveaways! Tools to learn how to create brush letting, how much fun! This may give me the nudge to start sewing on my pages. And I like the idea of a kit to learn to do brush lettering. Beautiful layout! Happy birthday SCT! Thanks for giving us the opportunity to win some great prizes! Good luck to all. It may be time to dust off some punches! This page is so cute. And that lettering set is such a fun prize. That layout is amazing! Such attention to detail. I love the prize too as I saw the Brush Lettering book in the latest Scrapbook and Cards Today magazine and am hoping to get my hands on a copy of it. I’d love to try my hand at it! Wow—great cards and products. Thanks for the opportunity to win. I love the cupcake punch! What a fun layout! I love Paige’s layout!!! Super cute!! Happy birthday SCT you guys are the best! Another day of amazing prizes! Oh my gosh…such a wonderful, creative layout! Thanks for the chance to win such a wonderful prize package! Happy Birthday SCT! Great prizes. Cute layout & drooling over the handlettering kit.I’m a beginner hooked on handlettering. Stunning layout! You have inspired me to dust off my new sewing machine and learn how to use it! Happy Birthday SCT! I used to do calligraphy back in college, and the current trend of brush lettering makes me itch to try my hand again. This would be a great prize to win – thanks!! Love the cupcakes! 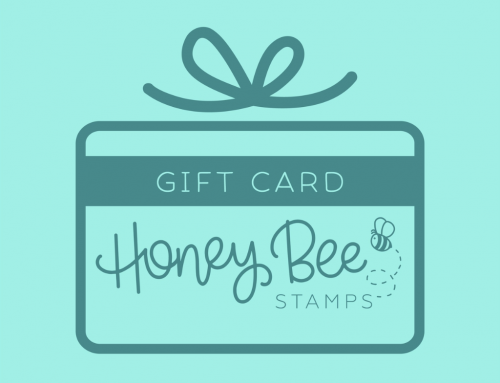 Amazing giveaway, I’m so hooked on Stampin Up! Paige is my scrapbooking idol! Love all her creative ideas. And who doesn’t want cupcakes for their birthday. What a cute idea!!! And, a great way to use up scraps!!! Love the sewing! I am getting a Birthday theme here!!! LOL! Thank you Happy Birthday SCT! Happy Birthday! I would love to win this prize! That tiny cupcake punch is so cute and again such great gifts! Very cute birthday layout. Happy Birthday! Love Stampin’ Up! Thanks for the chance. Wow! One of these days I WILL try sewing on my layouts! It looks so fantastic! Gives it that extra pop! Boy, those are sure some small photos, and the cupcakes…so amazeballs cute! Thanks for sharing with us! Paige’s layout is so cute, especially like the stitching. Yo could use this idea for lots of different motifs. I’ve been working on improving my hand lettering skills! Happy 12th Birthday!!! Great giveaways. Thanks for the chance to win! What a fun layout Paige! Always inspiring! like the layout love the stitching detail. . Happy Birthday SCT! Beautiful layout, another great giveway. Cupcakes! Isn’t that just too cute?! Love those gorgeous cards! Congrats, again, on your 12th anniversary! Congrats on another year older! Love all these great prizes. Looks fun!! Beautiful cards too! !